The 23-year old Palma is on his last year at UE. In his five years there, he’s been through three coaches — Jerry Codinera, Boycie Zamar, and now, Pumaren. 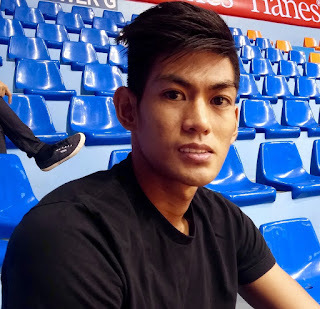 The Nueva Ecija native (although he studied in high school in Aurora, Quezon due to an aunt helping his family out) has tantalized and frustrated with his talent. Even with the talent-laden teams that UE put on the floor recently, Palma’s talent was obvious. He just needs to bring it. Case in point. His current showing in the Filoil Flying V Premier Cup. In their massive opening day win over Ateneo in overtime, Palma was wreaked havoc on both ends of the court especially during crunchtime tallying 22 points, 8 rebounds, 3 assists, and 2 steals. In the loss to La Salle in their next outing, the team, not only Palma crashed and burned. Renz finished with a disappointing 5 points, 3 rebounds, and 2 assists. He somewhat hiked his numbers in the huge win over tough Lyceum 91-75 (the blowout happened in the game’s last five minutes) to 9 points, 4 rebounds, 3 assists, and 1 steal however, it’s not enough. “It’s good because we got a win,” summed up Pumaren after the match, “but Renz is better than that." Growing up and balling in Aurora, Quezon, Palma idolized only two players — San Miguel Beer’s Arwind Santos and the Cleveland Cavaliers’ LeBron James. “I’m a big fan,” said Renz of James that he readily switched allegiances when the NBA star took his talents to South Beach. Palma points to their being two-way players. While he is built nothing like Santos or James, Renz appreciates what they bring to the table on a daily basis. It is what he strives for — being a two-way impact and consistent player. “Maasahan” is the term Palma uses to describe them and it is what he places as a goal for himself more so this final year. While he wishes that he could have contributed much earlier in his college career to his team’s efforts, he is one person who quickly puts away the disappointment of failures past. A few years ago, the Red Warriors were like a Wild West show. Running, gunning, and dunking with players like Roi Sumang, Charles Mammie, Adrian Santos, Lord Casajeros, Ralf Olivares, Jay-Arr Sumido, and Gino Jumao-as to name a few. But that team fell flat in its face in UAAP Seasons 76 and 77. Then the team was broken up some due to graduation, some left, while some were removed. “No, time para sa team namin mag-shine."